Emily is making the most interesting bag. 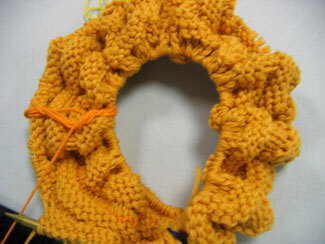 It's knit as a moebius strip, following a pattern in one of the Cat Bordhi Magical Knitting books. I can't wait to see how it turns into a bag! Look at this neat "cake" of yarn that Emily is knitting from! It's unspun icelandic wool from Schoolhouse Press and it comes in what they call "wheels". Emily's using it for yet another gorgeous lace project. There's a new knitblog in town! Emily, who makes incredible shawls and does intricite fair-isle work, has started a new blog. 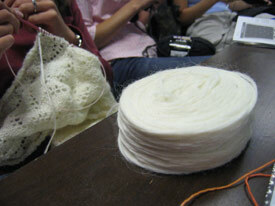 Check it out: The Knitting Process. Emily is an amazing knitter. She creates the most beautiful fair-isle mittens and hats and the loveliest lace shawls. And she's our go-to girl for all our really technical questions. 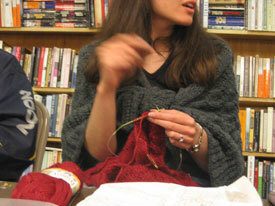 Here she is wearing one of her gorgeous shawls while adding an edging to another.